COTS are unusually large sea stars that can grow to almost a meter in diameter. They have up to 19 arms, with the entire upper surface covered with sharp venomous spines and can move up to 20 meters an hour. Due to their voracious appetites for live coral, COTS are one of the best known sea stars. 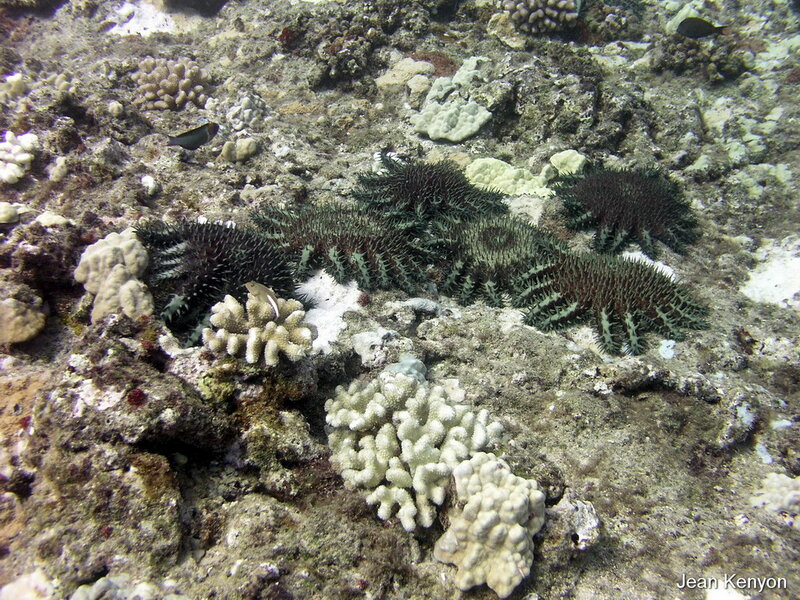 COTS can take over coral reefs quickly due to their ability to spawn millions of eggs a year. Once fertilized, eggs grow into planktonic larvae in 24 hours, which drift in ocean currents. The juveniles are 1-2 mm across when they settle onto the reef and live among rocks and rubble, eating encrusting coralline algae. At approximately six months of age they start to eat coral and begin to grow more rapidly, reaching reproductive maturity when they are 2-3 years old, breeding up to 7 years. Each female can produce up to 60 million eggs during a single spawning season. COTS have the highest measured fertilization rate of any invertebrate: therefore a small population of COTS has the potential to produce a very large number of offspring. COTS feed on coral by pulling its stomach out of its mouth with its tube feet and placing it on the coral. Digestive enzymes kill the live coral and the stomach absorbs the tissue, leaving the white calcium carbonate skeleton. COts outbreak on rice corals northern Oahu. In Hawai`i, Crown-of-Thorns primarily feed on rice, lace, and cauliflower corals. Healthy reef systems can support small populations of COTS for many years with only a small reduction in coral cover. But when a COTS outbreak occurs, there can be many animals per square meter, and competition for food forces them to eat all coral species, killing most of the living coral in the area. It can take decades for the reef to recover. Natural controls include the high mortality of the larvae, high predation of juvenile Crown-of-Thorns, and feeding on adults by Triton’s trumpets, Harlequin shrimp, and stripebelly puffers. Natural changes in the population. Natural fluctuations in temperature, salinity or planktonic food availability could all contribute to improving the survival of COTS larvae. Removal of predators. Loss of natural predators that feed on the juvenile and adult COTS an be costly. Predation on juveniles decreases the number of COTS that reach reproductive maturity. Increased nutrients lead to increased planktonic food, improving larvae survival. COTS have been present on reefs for millions of years, but major outbreaks were not observed until the 1960s. Outbreaks sometimes occur in areas with high levels of nutrients, which generally accumulate from terrestrial runoff. During outbreaks, COTS not only eat live, adult coral, but also prevent the recruitment of juvenile corals. This prevents coral population growth, hindering a coral colony’s ability to recover from predation. Each sea star can eat up to a meter-squared of coral each month, so when their populations become large they can quickly kill entire coral colonies. Once the sea stars deplete one area of live coral, they move on to adjacent regions. Outbreaks of COTS typically last between 1-5 years, although on large complex reef systems an outbreak can last 15-20 years. This is due to the fact that many reefs are in close proximity, which allows the COTS to spread from reef to reef. After an outbreak, the reefs begin to recover, but it may take one or many decades for them to reach original levels of coral cover. In some case studies, the reef’s community structure completely changes as the reef shifts from coral to algae dominated. There are few options to manage outbreaks of COTS and it is impossible to eradicate COTS from reefs where they are in outbreak densities. However, with sufficient effort, small areas can be protected. Because sea stars can quickly move from one area to another, control of a specific area must be an ongoing effort and may be required on a daily basis. Thus, early detection and reporting of any unusual numbers of COTS can help reef managers minimize the impact of a COTS outbreak. Online report forms for the EOR Network can be found at www.eorhawaii.org/make-a-report.